The French Revolution began in 1789. It was more complex, more violent, and more radical than the American Revolution. It tried to create both a new political order and a new social order. The immediate causes of the French Revolution were economic problems at the time, but there were also long range problems that created an environment for revolution. 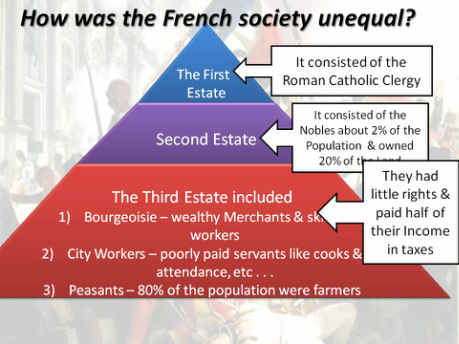 Before the revolution, French society was based on inequality. France was divided into three orders, or estates. The First Estate consisted of the clergy. There were about 130,000 people in the First Estate. They owned about 10 percent of the land and were exempt from the taille, the main tax in France. The Second Estate was the nobility. There were about 350,000 people in this estate. They owned about 25 to 30 percent of the land. They held many of the leading positions in the government, military, courts, and the higher church offices. They were also exempt from the taille. The Third Estate consisted of the commoners. This was the majority of the French population. The Third Estate was further divided by occupations and wealth. The peasants were the largest segment of the Third Estate. They were about 75 to 80 percent of the total French population. As a group, they owned about 35 to 40 percent of the land, but over half of them had little or no land on which to survive. Serfdom had been largely eliminated, but French peasants still had obligations to their local landlords. These relics of feudalism, or aristocratic privileges, were obligations that survived from an earlier age. The peasants deeply resented these obligations, which included fees to use village facilities, such as the flour mill, community oven, and wine press. Another part of the Third Estate consisted of skilled craftspeople, shopkeepers, and other wage earners in the cities. A rise in consumer prices that was greater than the increase in wages made it difficult for these urban groups to survive. This struggle for survival led many of these people to play an important role in the revolution. The bourgeoisie, or middle class, was another part of the Third Estate. This group included about 8 percent of the population, or 2.3 million people. They owned about 20 to 25 percent of the land. This group included merchants, bankers, industrialists, doctors, lawyers, and writers. Members of the middle class were unhappy with the privileges of the nobility. At the same time, they had a great deal in common with the nobility. By obtaining public offices, wealthy middle-class people could become part of the nobility. Members of the nobility and the bourgeoisie were both influenced by the new ideas of the Enlightenment. Many of the people in both of these groups were opposed to the monarchy. The social inequality in France created the background for the French Revolution, but the immediate cause of the revolution was the near collapse of government finances. Bad harvests in 1787 and 1788 and a slowdown in manufacturing led to food shortages, rising prices for food, and unemployment in the cities. The number of poor reached crisis proportions. At the same time, the French government continued to spend enormous amounts of money on wars and luxuries. The queen, Marie Antoinette, was known for her extravagance. On the verge of a complete financial collapse, the government of Louis XVI was forced to call a meeting of the Estates-General. This was the French parliament, and it had not met since 1614. The Estates-General was composed of deputies (representatives) from the three estates. The First and Second Estates had about three hundred delegates each. The Third Estate had almost six hundred delegates. In order to fix France’s financial problems, most members of the Third Estate wanted to set up a constitutional government that would abolish the tax exemptions of the clergy and nobility. The meeting of the Estates-General opened at Versailles on May 5, 1789. There was an immediate dispute about voting. Traditionally, each estate had one vote. That meant that the First and Second Estates together could outvote the Third Estate two to one. The Third Estate demanded that each deputy have one vote. With the help of a few nobles and clerics, that would give the Third Estate a majority. The king, however, declared that he was in favor of the current system, in which each estate had one vote. The Third Estate reacted quickly. On June 17, 1789, it called itself a National Assembly and decided to draft a constitution. When the deputies of the Third Estate arrived at their meeting place three days later, they found the doors locked. They moved to a nearby indoor tennis court and swore that they would continue to meet until they had produced a French constitution. The oath they swore is called the Tennis Court Oath. Louis XVI began to make plans to use force against the Third Estate. But before he could do this, a mob of Parisians stormed the Bastille, an armory and prison in Paris. They tore the Bastille apart, brick by brick. This took place on July 14. Paris soon came under the control of the rebels. Louis XVI was no longer in control. Revolutions and peasant rebellions broke out throughout France. They became part of the Great Fear, a panic that spread quickly through France in the summer of 1789. Citizens began to form militias, because they were afraid that they would be invaded by foreign troops that supported the French monarchy. One of the first acts of the National Assembly was to destroy the relics of feudalism. On August 4, 1789, the National Assembly voted to abolish the rights of landlords and the financial privileges of the nobility and clergy. On August 26, the National Assembly adopted the Declaration of the Rights of Man and the Citizen. This was a charter of basic liberties that was inspired by the American Declaration of Independence and Constitution and the English Bill of Rights. It proclaimed freedom and equal rights for all men, access to public office based on talent, and an end to exemptions from taxation. All citizens were to have the right to take part in the making of laws. Freedom of speech and the press were guaranteed. The guarantee of equal rights did not include women, however. In response, Olympe de Gouges, a female author, wrote a Declaration of the Rights of Woman and the Female Citizen. In it, she insisted that women should have the same rights as men. But the National Assembly ignored her demands. Louis XVI remained at Versailles and refused to accept the National Assembly’s decrees on the abolition of feudalism and the Declaration of Rights. On October 5, thousands of Parisian women marched to Versailles. They forced the king to accept the new decrees. They insisted that the royal family return to Paris to show the king’s support of the National Assembly. On October 6, the royal family moved to Paris, where they became virtual prisoners. The Paris Commune had forced the Legislative Assembly to call a National Convention. 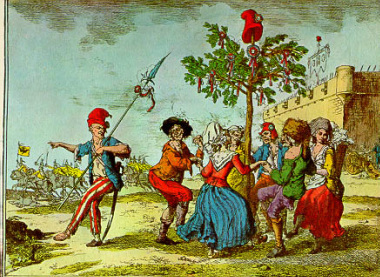 The sans-culottes (members of the Commune) took other steps toward a more radical revolution. They took revenge on people who had helped the king or resisted the revolution. Thousands of people were arrested and killed. New leaders, such as Jean-Paul Marat, encouraged the poor to use violence to get what they needed. In September 1792, the newly elected National Convention began to meet. Although it had been created to draft a new constitution, it also acted as the ruling body of France. The Convention was dominated by lawyers, professionals, and property owners. Almost all of the deputies distrusted the king. The Convention’s first major step was to abolish the monarchy and establish a republic, the French Republic. The Paris Commune favored radical change and put constant pressure on the National Convention to adopt more radical positions. The National Convention did not rule all of France, however. Peasants in western France and people in France’s major provincial cities refused to accept the authority of the National Convention. The members of the Convention soon split into factions (dissenting groups) over the fate of the king. The two most important factions were the Girondins and the Mountain. Both factions were members of the Jacobin club, a large network of political groups throughout France. The Girondins represented the provinces, the areas outside the cities. The Girondins feared the radical mobs in Paris and wanted to keep the king alive. The Mountain represented the radicals in Paris. The Mountain won at the beginning of 1793 when they convinced the National Convention to condemn Louis XVI to death. He was beheaded on the guillotine on January 21, 1793. The execution of the king outraged the royalty of most of Europe. An informal coalition of Austria, Prussia, Spain, Portugal, Britain, and the Dutch Republic took up arms against France. By the spring of 1793, they were ready to invade France. To meet this crisis, the National Convention gave broad powers to a special committee of 12 known as the Committee of Public Safety (COPS). It was dominated at first by Georges Danton, then by Maximilien Robespierre. For roughly a year during 1793 and 1794, the Committee of Public Safety took control. The Committee acted to defend France from foreign enemies and rebellions at home. The Committee set in motion an effort that came to be known as the Reign of Terror. 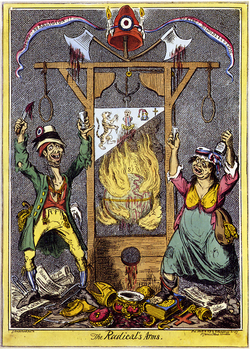 During the Reign of Terror, nearly 40,000 people were killed, many by the guillotine. Most executions were held in places that had openly rebelled against the authority of the National Convention. The Committee of Public Safety decided to make an example of the city of Lyons. 1,880 people in that city were executed. In western France, the revolutionary armies were brutal in defeating rebel armies. Perhaps the most notorious act of violence occurred in Nantes, where victims were executed by being sunk in barges in the Loire River. People from all classes were killed during the Terror. About 15 percent of the victims were from the clergy and nobility, and the rest were from the bourgeoisie and peasant classes. The Committee of Public Safety took other steps to control France and to create a new order, called the Republic of Virtue. The Committee tried to provide some economic controls by establishing price limits on goods considered necessities, such as food, fuel, and clothing. But the controls did not work very well. The National Convention also pursued a policy of dechristianization. The word saint was removed from street names, churches were pillaged or closed, and priests were encouraged to marry. In November 1793, a public ceremony dedicated to the worship of reason was held in the cathedral of Notre Dame. A new calendar was also adopted. Years were no longer numbered from the birth of Christ but from September 22, 1792—the first day of the French Republic. Sundays and church holidays were eliminated. Dechristianization failed to work, however, because France was still overwhelmingly Catholic. Women were actively involved in the revolution. Women observed sessions of the National Convention and made their demands known. In 1793, two women founded the Society for Revolutionary Republican Women. This group was made up of working-class women. They were ready to defend the new French Republic if the need arose. Many men, however, continued to believe that women should not participate in political and military affairs. Guillotine: France's main method of execution until 1977. To save the republic from its foreign enemies, the Committee of Public Safety decreed a universal mobilization of the nation on August 23, 1793. In less than a year, the revolutionary government had raised a huge army. By September 1794, the army numbered over one million. The republic’s army was the largest in European history. It pushed the allies invading France back across the Rhine and even conquered the Austrian Netherlands. The French revolutionary army was a new kind of army. It was not made up of professional soldiers. It was created by a people’s government. Its wars were people’s wars, not wars between rulers. By the summer of 1794, the French had defeated most of their foreign enemies. There was less need for the Committee of Public Safety, but it continued to exist. Robespierre had become very powerful and was obsessed with ridding France of all its corrupt elements. Many deputies in the National Convention feared Robespierre and voted to execute him. He was guillotined on July 28, 1794. After his death, more moderate leaders took control, and the Reign of Terror came to an end. The National Convention reduced the power of the Committee of Public Safety. Churches were allowed to reopen. A new constitution was created in August 1795. It established a national legislative assembly. It had two chambers: a lower house, known as the Council of 500, which initiated legislation, and an upper house, the Council of Elders, which accepted or rejected the proposed laws. The members of the two chambers were chosen by electors (individuals qualified to vote in an election). The electors had to be owners or renters of property worth a certain amount. This limited the number of electors to 30,000. The Council of Elders elected five directors to act as the executive committee, or Directory. The Directory and the legislature ruled the country. The period under the government of the Directory (1795-1799) was a time of corruption. The Directory had many enemies. Both royalists and radicals were unhappy. Royalists wanted to restore the monarchy. Radicals were unhappy with the turn toward moderation. The Directory was unable to find a solution to the country’s economic problems, and it was still carrying on wars started by the Committee of Public Safety. In 1799, a coup d’état (a sudden overthrow of the government) ended the Directory. The coup d’état was led by the successful and popular general Napoleon Bonaparte. Napoleon was born in 1769 on the island of Corsica. His family came from Italy. As a young man, Napoleon received a scholarship to study at a military school in France. In 1785, he was commissioned as a lieutenant in the French army. He rose quickly through the ranks. By age 24, he was made a brigadier general. In 1796, he became commander of the French armies in Italy, where he won many victories. He was able to win the confidence of his men and the support of many people because of his energy, charm, and intelligence. In 1797, he returned to France as a hero. He was given the command of an army in training to invade Britain. He proposed that France strike indirectly at Britain by taking Egypt and threatening India. However, because the British controlled the seas, they were able to cut off Napoleon’s army in Egypt. Napoleon abandoned his army and returned to Paris. In Paris, Napoleon took part in the coup d’état that overthrew the government of the Directory. A new government called the consulate was proclaimed. As first consul, Napoleon controlled the entire government. He appointed members of the bureaucracy, controlled the army, conducted foreign affairs, and influenced the legislature. In 1802, he was made consul for life. Two years later, he had himself crowned Emperor Napoleon I. One of Napoleon’s first acts at home was to establish peace with the oldest enemy of the revolution, the Catholic Church. Napoleon himself had no personal religious faith, but he saw the need to restore stability to France. In 1801, Napoleon made an agreement with the pope. The agreement recognized Catholicism as the religion of a majority of the French people. In return, the pope agreed not to ask for the return of the church lands seized in the revolution. This agreement was popular both with Catholics and with people who had bought church lands during the revolution. Napoleon’s most famous domestic achievement was his codification of the laws. Before the revolution, France did not have a single set of laws but almost 300 different legal systems. Napoleon completed seven codes of law. The most important of the codes was the Civil Code (also called the Napoleonic Code). This code preserved most of the gains of the revolution by recognizing the principle of the equality of all citizens before the law, the right of the individual to choose a profession, religious toleration, and the abolition of serfdom and feudalism. Property rights were carefully protected. The rights of women were curtailed, however. Divorce was still allowed, but it was difficult for women to get divorces. When women married, their property came under the control of their husbands. In lawsuits, they were treated as minors. Napoleon worked hard to develop a bureaucracy of capable officials. Promotion was based on ability, not on rank or birth. This was a change that the middle class had wanted before the revolution. Napoleon also created a new aristocracy based on merit in the civil or military service. 3,263 new nobles were created between 1808 and 1814. Only 22 percent of Napoleon’s aristocracy came from the nobility of the old regime. Almost 60 percent were middle class people. Napoleon claimed that he preserved the gains of the revolution. In some respects, this was true. The Civil Code preserved the equality of all citizens. Opening government careers to more people was another gain. On the other hand, Napoleon destroyed some revolutionary ideals. Liberty was replaced by despotism. He also eliminated freedom of the press. He shut down 60 of France’s 73 newspapers and required that all manuscripts be approved before they were published. Even the mail was opened by government police. When Napoleon became consul in 1799, France was at war with a European coalition of Russia, Great Britain, and Austria. Napoleon achieved a peace treaty in 1802, but it did not last long. War with Britain broke out again in 1803. Britain was eventually joined by Austria, Russia, Sweden, and Prussia. In a series of battles, Napoleon’s army defeated the Austrian, Swedish, Prussian, and Russian armies. From 1807 to 1812, Napoleon was the master of Europe. His Grand Empire was composed of three parts: the French Empire, dependent states, and allied states. The French Empire consisted of an enlarged France that extended to the Rhine in the east and included the western half of Italy north of Rome. Dependent states were kingdoms under the rule of Napoleon’s relatives. These included Spain, Holland, the kingdom of Italy, the Swiss Republic, the Grand Duchy of Warsaw, and the Confederation of the Rhine (a union of all German states except Austria and Prussia). Allied states were countries defeated by Napoleon and forced to join his struggle against Britain. They included Prussia, Austria, Russia, and Sweden. Within his empire, Napoleon tried to spread some of the principles of the French Revolution, including legal equality, religious toleration, and economic freedom. In many areas, the nobility and clergy lost their special privileges. Napoleon’s Grand Empire collapsed almost as quickly as it had been formed. There were two main reasons for Napoleon’s defeat: the survival of Great Britain and the force of nationalism. Britain’s survival was due primarily to its sea power. Napoleon hoped to invade Britain, but the British navy’s defeat of a combined French-Spanish fleet at Trafalgar in 1805 destroyed any idea of an invasion. Napoleon then turned to his Continental System to defeat Britain. The goal of the Continental System was to prevent British goods from reaching the European continent. Napoleon hoped to weaken the British economy by preventing the sale of British goods. But the Continental System failed. Allied states resented being told that they could not trade with the British, and some began to cheat. New markets in the Middle East and in Latin America gave Britain other outlets for its goods. By 1809–1810, British exports were at near-record highs. The second important factor in the defeat of Napoleon was nationalism. 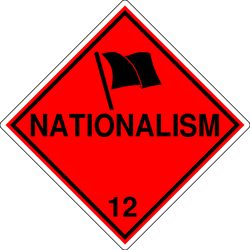 Nationalism is the unique cultural identity of a people based on common language, religion, and national symbols. Napoleon’s spread of the principles of the French Revolution beyond France indirectly brought a spread of nationalism as well. The French aroused nationalism in two ways. First, they were hated as oppressors. This hatred stirred the patriotism of other peoples in opposition to the French. Second, the French showed the people of Europe what nationalism was and what a nation in arms could do. The Russians refused to remain in the Continental System. This left Napoleon with little choice but to invade Russia. In June 1812, a Grand Army of over six hundred thousand men entered Russia. Napoleon’s hopes for victory depended on a quick defeat of the Russian armies. But the Russian forces refused to fight. They retreated for hundreds of miles. As they retreated, they burned their own villages and countryside to keep Napoleon’s army from finding food. When the Grand Army arrived in Moscow, they found it on fire. Without food and supplies, Napoleon abandoned Moscow and began the “Great Retreat” across Russia. Less than forty thousand of the original army made it back to Poland. This military disaster led other European states to attack the French army. Paris was captured in March 1814. 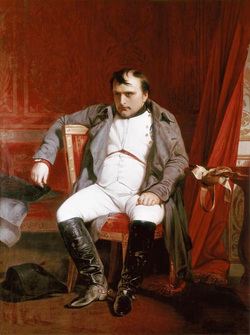 Napoleon was sent into exile on the island of Elba. The Bourbon monarchy was restored to France. Louis XVIII became king. He was the brother of the executed king, Louis XVI. The new king had little support, and Napoleon was able to slip back into France. When troops were sent to capture him, they went over to his side. Napoleon entered Paris in triumph on March 20, 1815. Napoleon raised another army and moved to attack the nearest allied forces in Belgium. At Waterloo in Belgium on June 18, 1815, Napoleon met a combined British and Prussian army under the Duke of Wellington. He was defeated and exiled to St. Helena, a small island in the South Atlantic.